Only Registered Cruisers may drive into and park in the different venues. In your registration packet is your Window ID Card; this is your entry into the site (not the decal). As soon as you get your Window ID Card, place the card in the windshield, on the dash or on the sun visor for the rest of your visit so you can enter the venues as many times as you wish. 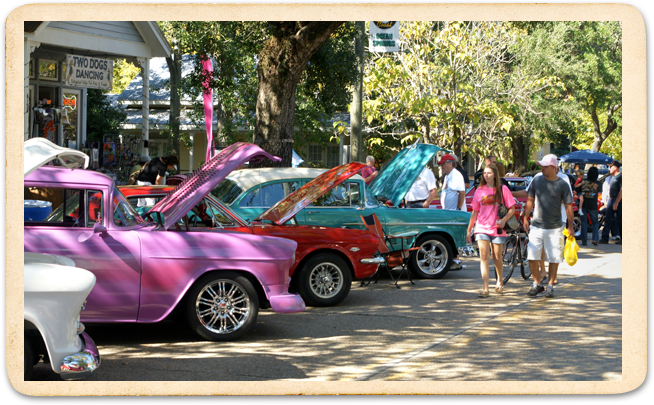 Spectators are welcome to come to our venues to see the beautiful cars, enjoy the bands, etc. You will have to park off the site and walk in to take part. There is no admittance fee for the venues, there is a fee for the Swap Meet. Monday – 11 a.m.-5 p.m.
Tuesday-Friday – 9 a.m.-5 p.m.
Friday & Saturday – 9 a.m.-5 p.m.
Open Thursday to Saturday, 9 a.m. to 5 p.m.
Thursday-Saturday – 9 a.m.-5 p.m. The run is approximately 45 miles long on Hwy 90.